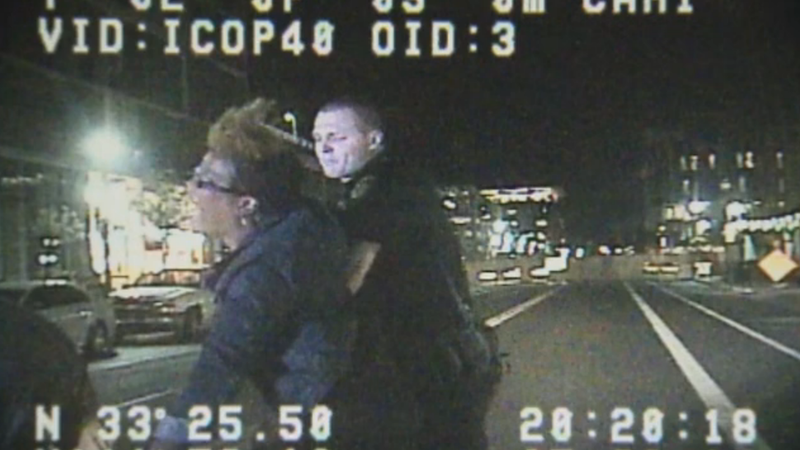 On May 20, Dr. Ersula Ore, an English professor at Arizona State University was stopped in the middle of the street by ASU Police Officer Stewart Ferrin for obstructing a public thoroughfare—jaywalking. When Ferrin asked for her identification, she refused to provide it, having been warned she faced arrest for not presenting it. Ore resisted arrest, dented and scratched a police vehicle, and kicked the arresting officer in the shin. She was arrested and is being charged with a class five felony aggravated assault and two misdemeanors. She has claimed that she was acting in self defense, and the story appeared to end there. But footage released this weekend shows that the altercation went down very differently than described. In the dash camera video, Ore, whose only threat was walking across a street to avoid construction on the sidewalk, clearly attempts to reason with the police officer, but is met with disregard which escalated into violence. Ferrin: Are you aware this is a street? Ore: You really want to do that? Do you see what I'm wearing? Do you see? Ferrin: I don't care what you are wearing. ORE: Don't talk to me like that. This entire thing has been about your lack of respect for me as a citizen, as a professor of...Arizona State University. Here's a video of the raw footage. It's all audio until 2:15—it is shocking, so be warned. Ferrin throws her to the ground, exposing her as she was wearing a dress. When the officers pull her to her feet and Ferrin attempts to adjust her dress and pull it back down, she kicks Ferrin in the shin. As Ferrin cuffs her, the other officer tells her to relax. "ASU authorities have reviewed the circumstances surrounding the arrest and have found no evidence of inappropriate actions by the ASUPD officers involved. Should such evidence be discovered, an additional, thorough inquiry will be conducted and appropriate actions taken..."
The Arizona Ethnic Studies Network has called out ASU on their response to the matter, demanding that they launch a "comprehensive investigation into this matter as well as an audit on the conduct of its police force vis-à-vis racial profiling." I think as far as liability goes it would be in their best interest to hope that it's not a case of racial profiling. That being said, I have several witnesses that were there that evening that were also crossing the street, and none of them happened to be black and none of them happened to be women. One of them called 911. Regardless, if he didn't like the way that Ore was speaking to him or if she was jaywalking, the reality is that these officers should be trained to diffuse the situation instead of exacerbate it…When it's contentious from the beginning, when the civilians are treated with disrespect, when they're treated as criminals right away, things like this happen and it's dangerous for everybody. But we need to have a discussion about how to prevent it…"